The HS-1 Hot Shoe Mount is an optional accessory for the H1 / H2n / H4n / H6 Handy Recorder. 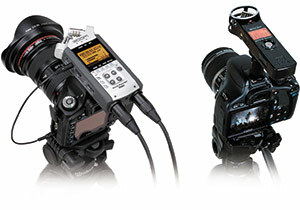 It allows you to attach your Zoom recorder to a DSLR video camera. The remarkable depth and clarity of sound achieved by the stereo X/Y mic design brings additional realism and depth to HD video.